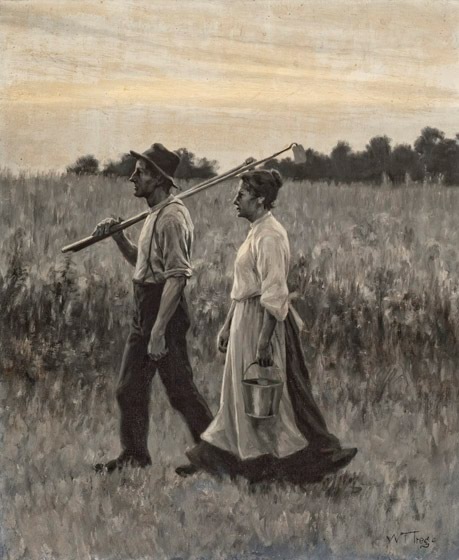 A farmer, carrying farm tools over his right shoulder, is accompanied by a woman presumed to be his wife carrying a bucket in her left hand. They are portrayed in full length and in profile as they walk from right to left in a field of wheat. As the work was painted in shades of black and white, with a slight touch of yellow in the sky, it is likely one of the works Trego did as an illustration in the last years of his life. Since it ended up in the possession of one of his cousins, it may be that he was unable to get the work accepted by the intended publisher. The couple are most likely neighbors who owned or worked on one of the several farms on the outskirts of North Wales. Trego did a quick oil sketch copy of this work some time later, adding a dog. The painting was obtained from the artist by a cousin and has been passed down in the owner’s extended family ever since. The painting is in very good condition, though it might benefit from cleaning.